The generally peaceful members of Clan rabbit are therians – generally disorganized and benevolent ones, but yeah. Like some other clans, rabbits may elect to be either medium (+2 Dex, -2 Str) or small (same attributes, but size modifications included), gain the ratfolk subtype, low-light vision, scent, +1 natural armor (which scales up to +2 at 10th level) and a primary slam attack at 1d4 (1d3 for small rabbits). They may choose from 4 racial heritages: Jackrabbits get +2 to Wis and may choose Rabbit Clan Heritage as a monk bonus feat. Moongazing Hares get the same benefits, but may instead select the racial heritage feat as a bonus feat granted by the crusader cleric archetype. Pika Bandits get +2 to Int and may select the racial heritage feat as a rogue talent. 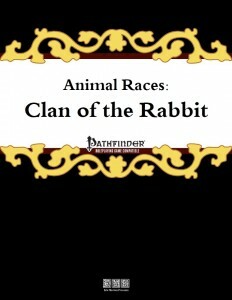 Finally, members of the Rabbit Clan get +2 Cha and may choose the racial heritage feat as a rogue talent. As always, the clan’s racial heritage feat can be taken multiple times, unlocking new racial traits, with the one ability that requires the previous ones being hard to catch. The traits let you withdraw in a crooked line via Acrobatics – which is pretty nice, though no DC for the Acrobatics-check is given. I assume the DC that would be applicable for moving through threatened squares, but I’m not sure. RAW, ANY Acrobatics-check suffices, which is odd to me. Increased movement and +1/2 HD jumping (plus always counting as having a running start) can also be taken. The aforementioned hard to catch ability grants you the Liberation domain’s 1st level domain power for character level rounds per day. Solid. Beyond the racial bonus feat, we also get Bounding Charge, which lets you change direction when charging by making an Acrobatics-check – once again, without specifying the DC of the Acrobatics-check required. Regarding the racial deity, we receive a take on trope of the bunny god in the moon, which should bring a smile to the faces of anyone remotely versed in Asian mythology. As always, the level of rooting the race in the world by linking it to established creatures is commendable and, once again, we receive the trademark cool heraldry-traits. These would be race traits that are linked to the respective crests – with rather significant benefits for traits, but also drawbacks where applicable – gain Skill Focus (Stealth) for -1 to all Ref-saves, for example. As additional content and as a means of tying the race to the other animal races, we are also introduced to a kind-of pantheon/philosophy as a secondary deity/cleric-option with the Zodiac Council. The details provided here are a joy to read and they tie in nicely with the eastern zodiac we know from our real life mythology. Eric Morton’s rabbit-clan is pretty interesting – mechanically, there is not much to complain besides the Acrobatics-hiccups I mentioned before and power-level wise, I also have no concerns. Still, when compared to e.g. the frogs, the rabbits feel a bit less diverse. They still are inspired and I consider the zodiac/astrology-theme cool, but at the same time, I would have enjoyed something playing against the stereotype in addition. Perhaps it’s just the rampant Sam and Max-fanboy in me, but I would have loved a carefree, cheerful psycho-bunny clan that is resilient and or just nasty. I’m aware that this is my own opinion, though, and thus, this will not have an impact on my verdict of the book. Ultimately, the clan of the rabbit offers a solid installment of the series, though one that falls behind in creativity regarding some previous ones. In combination with the missing Acrobatics-DCs/notes which type of Acrobatics-check is required, we have a good, but not perfect book. My final verdict will hence clock in at 4 stars.